The Résidence Andréa Le Mas Rétais, in the heart of the beautiful village of La Flotte-en-Ré (listed by the label Les plus beaux villages de France) offers 9 rentals from 3/5 guests to 4/6 guests. 4 stars comfort. For any question or for booking you can join the owner 7/7j from 9.30 a.m to 10.00 p.m calling the +335 46 35 03 35. For information or availability, just call the +335 46 35 03 35. Thank you and see you soon! We offer 10 high-standard rentals for a fair price. In the Andréa residence, you will enjoy our quiet and spacious houses with authentic charm (rated 4 stars by the prefecture). The house described in this advertisement has 3 spacious rooms. You will enjoy the typical Isle of Rhé style with overwhelming natural materials. With a terrace and teak garden furniture, the garden offers a modern and large Jacuzzi (for 6), for complete relaxation. For your stay on the Isle of Rhé, go for an upper class accommodation (rated 4 stars by the prefecture)! We take great care to the cleanliness of our accommodations. For more information, send us an email with your phone number and I will provide you more information about the Isle of Rhé and our rental offers. We apply substantial digressive prices according to the number of guests. Information, availabilities and bookings by telephone. The owners are available 7 days a week. In the Andréa residence you will find 10 furnished holiday rentals rated 4 stars on the Isle of Rhé. The residence is located in the heart of a quiet area of the picturesque village of la Flotte-en-Ré (village listed by the label Les plus beau villages de France), just a few metres away from the beach's pedestrian streets, the ocean front and close to the thalassotherapy centre. Our typical small houses, houses, suite lodges or luxurious villas on the Isle of Rhé are perfect for couple, family or friends holidays. The small duplex houses (50 to 68 sq.m) offer a living/dining room, an open-plan equipped kitchen, a lounge area (equipped with a comfortable sofa-bed), 2 bedrooms with a double bed or 2 single beds or bunk beds. There is also a bathroom and separate WC (details of the layout on request), a patio-terrace and garden furniture, sun beds and a shared outside large Jacuzzi. Our residence offers variable capacity rentals between 2 to 8 persons. The rental houses have a high speed Wi-Fi connexion. The private parking of the residence is available for free. The rentals in high season, from April to September, run from Saturday to Saturday for a minimum of 7 days. You will get a 5 to 10 % discount if you stay two weeks or more. Pets are allowed for 4€ a day. ANCV holiday vouchers accepted. We are part of the Agence National des Chèques Vacances. Our high standard rentals with a cosy comfort offer you the gentle way of life 'made in Isle of Rhé'. The happy owners of this rental complex, Dominic and Caroline Berjon, are at your disposal 7/7d by phone from 9.00 a.m to 10.00 pm. For any information, question about availability, or booking formulas call us. The rentals have a high speed Wi-Fi connexion. The private parking of the residence is available for free. For any information, question about availability or booking formulas call us. All our high comfort and variable capacity rentals have been listed by the Charente-Maritime prefecture. They offer a very good price-quality ratio. Have a fare price rental experience! With the Résidence Andréa Le Mas Rétais: 100% premium 'Rhé life style' holidays, or the peaceful and charming family homes on the Isle of Rhé! Quick information and bookings by phone available 7/7j from 9.00 a.m to 10.00 p.m. See you soon! 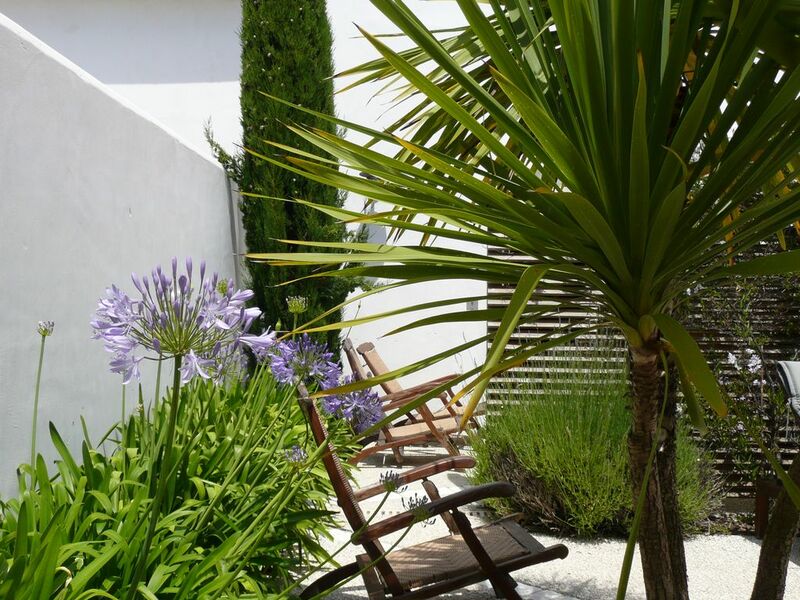 These peaceful rentals are located in the heart of the picturesque village of La Flotte-en-Ré. Here you can forget your car in the parking. You can go anywhere walking or by bike. And the comfort is really important when you want to rest or relax. Our home definitely offers that! Our bathrooms are equipped with a large bathtub combined with a high shower head shower. The shower screens are in glass for more hygiene. The toilets are separated except in a shower room for disabled persons. We particularly focus on the perfect hygiene of our bathrooms. Optional: you can rent towels for 15€. It includes 2 bath towels and 4 towels. The rentals in the Andréa residence offers equipped kitchens. Dining area, dining room and teak furniture. This charming house rental on the Isle of Rhé is located in the heart of the picturesque village of la Flotte-en-Ré (village rated among the most beautiful ones in France). Have a walk in the alleys full of flowers and go to the shops and the daily medieval market (150 m away) where there are plenty of greengrocers, shellfish and fresh fish sellers. The harbour and the boats are also very close (250 m). Sea excursions are available in catamaran with a skipper. You will find on the port and the village's Croisette many restaurants and a playground for children with ocean views. The beach, 400 m away from the house, received a Pavillon Bleu label few years ago. This beach is very popular for its sand’s quality and its waters protected by Flotte-en-Ré's Bay. An access to the beach for disabled persons is opened in high season. The house is ideally located at the crossroads of many cycle paths (100 km) which will take you everywhere on the Isle of Rhé. taxe de séjour île de Ré NON INCLUS au tarifs , la taxe se règle avec la solde de la location sur place. les options : ménage de départ ou location du linge se règle sur place . La Taxe animalière se règle sur place 4 euros par jour . La caution de garantie dégradation est à déposer par chèque bancaire ou espèce sur place , cette caution est restituée au départ . +d'infos 06 89 28 72 43 . La"3w"RESIDENCE ANDREA "point comme"vous communique dans votre boite e mail un contrat de location détaillé avec ses conditions générales de vente .